As an undergraduate student in biology, Anja Geitmann was already passionate about plants and microscopy. Observing photographs of the external architecture of pollen grains, revealed in spectacular detail by a scanning electron microscope, her future career path became clear. Her unique career path led to her specialise in the biomechanical development of pollen tubes. In her research experiments, she draws upon a combination of advanced techniques from engineering, molecular biology and, to her delight, microscopy. She now manages the microscopy platform at the IRBV. 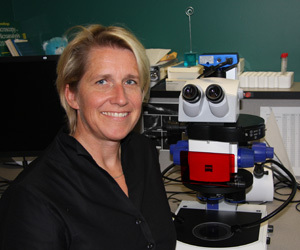 It is therefore no surprise that she should be named head of the Microscopical Society of Canada. Congratulations!